Obama: I'll Veto A 'One-Sided Deal' : The Two-Way He says he won't sign a plan that changes entitlements unless it also asks more from the wealthy. Combined with $1 trillion in spending cuts agreed to this summer, Obama said his plan would trim "more than $4 trillion ... in a way that is fair." Saying that "Washington has to live within its means" and that lawmakers must "cut what we can't afford to pay for what really matters," President Obama just introduced what he says is a plan to cut an additional $3 trillion from budget deficits over the next decade. And he vowed to veto any legislation that puts all the burden of deficit reduction on those who rely on Medicare and other social programs. "It will not happen on my watch," declared Obama, in making the case that the wealthy and corporations must also be asked to pay more in taxes. "We know what's right. 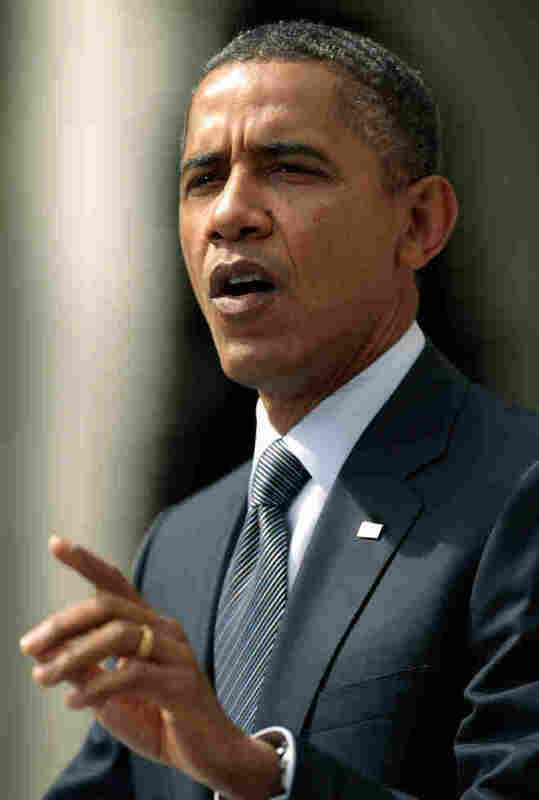 It's time to do what's right," Obama said. Combined with $1 trillion in spending cuts already agreed to earlier this summer, the president said, his plan would trim "more than $4 trillion and achieves these savings in a way that is fair." It "includes $2 in spending cuts for every $1 in new revenues," Obama added. "We can't just cut our way out of this hole," said the president, in making the case for eliminating "tax loopholes" — the so-called Bush tax cuts — that primarily go to the wealthiest Americans and corporations. He decried Republican opposition to any steps to raise tax revenues. It can't be "my way or the highway," he said, referring to House Speaker John Boehner (R-OH) and other GOP leaders. And Obama again made the case that "there's no justification" for millionaires and billionaires paying lower tax rates than middle-class families. "Anybody who says we can't change the tax code" to end that, "should be called out," Obama said. "They should have to defend that unfairness." The White House just posted its report on the president's plan here. Earlier, we posted about "Five Things To Know About Obama's Deficit Plan." Update at 11:45 a.m. ET: On Morning Edition a moment ago, NPR's Mara Liasson said the president was "putting down a very specific plan" while also "putting down his platform for the 2012 election." As for whether the president's plan and pledge to veto any legislation that isn't "balanced" in his view, Mara said that "yes, we're at a stalemate" if he holds to that position and Republican leaders hold to their opposition to any changes that raise taxes on anyone. -- A little over $1 trillion in the projected deficit-reduction would come from winding down the wars in Iraq and Afghanistan. -- About $1.5 trillion would come from higher tax revenues. -- Around $430 billion would be thanks to projected savings in interest costs. -- And then there's the $1.2 trillion spending cuts agreed to earlier this summer.